WILLIAMSTOWN, Mass. -- The town has taken a first step toward creating a super-fast Internet competitor to Time Warner cable, and Crocker Communications Inc., the Greenfield-based company which managed building a municipal system for Leverett, Mass., said on Friday it may be interested in helping. Responses are due by May 20 to a town "Request for Information" which was posted on Williamstown.net -- the town's website -- on Thursday. The RFI says the town is evaluating "options for making broadband available to its residents and businesses" by "evaluating the last-mile options to make fiber optic cable available to its residents and businesses." In an email exchange with GreylockNews.com, Matt Crocker, president of family owned Crocker Communications Inc., said: "We are very interested. Thanks for sending me the link. We will work up a response." Crocker's participation in the Leverett 1-gigabit municipal Internet system has been written up as a national case study. Now, nearly 500 Western Massachusetts residents are petitioning Massachusetts Gov. Charles Baker to release $50 million in funds to build rural broadband. The town's RFI, authored by Selectman Andrew Hogeland, notes that the quasi-public Massachusetts Broadband Initiative delivers super-fast Internet service to Williams College and the Clark Art Institute, as well as to town buildings and other community-anchor institutions such as town hall, the library, schools and fire station. But so far, connecting this government-owned and paid-for Internet connectivity, has proved a competitive and bureaucratic challenge throughout Western Massachusetts, despites its educational value. In effect, super-fast, publicly owned Internet connections exists throughout the region, but almost no citizens can connect to them. The town's RFI is a response to suggestions in last year's town Economic Development Committee report. Hogeland served on the committee. That December 2015 report concluded the town "should continue to investigate the potential of broadband access to be a community asset for both residents and businesses, and to understand the project scope, costs, benefits and organization options for such a project so that an informed decision can be made whether to pursue broadband access." Connections to the Internet have been available in Williamstown and the region for at least 25 years, first through "dial-up" phone connections, then through so-called "Digital Subscriber Lines" -- DSL -- via phones, and for at least 20 years from the monopoly cable-television franchisee -- now Time Warner Cable and soon to be Charter Communications via a merger. But the issue has been speed of access. As entertainment -- movies and other services such as connection to medical-technology or distance learning -- have increasingly moved from text to multi-media, the need for faster connections is seen by some as an economic-development priority. Verizon has technical difficulty delivering speeds of more than 5 megabits/second over phone lines because they are copper wires to homes; Time Warner's fiber-optic cable lines to homes can support speeds many times faster, but Time Warner's prices for doing so are prohibitively high for consumers -- $80 a month for only 10 megabits/second -- barely fast enough to watch a low-definition movie. Also, both Verizon and Time Warner's standard services are "asynchronous" -- the speed to download (consume) information are as advertised, but the speeds to upload (create) information are a fraction of that. Thus they create a culture and reality of consumption rather than creation. By contrast, Leverett residents, served by Massachusetts Broadband and local fiber-optic cables managed by Crocker, delivers 1 gigabit service to homes (that's 1,000 megabits/second) for $80/month -- or about 100 times the monopoly broadband supplier Time Warner is selling for $80/month. And the Leverett service is "synchronous" -- the upload and download speeds are the same. Last year, Citizen Media Inc., the non-profit publisher of the Greylock Independent newsletter and website, organized a community discussion of broadband options for the region. Despite repeated invitations, neither Verizon nor Time Warner sent any representatives to the discussion. Besides non-broadband consumer Internet services provided by Verizon, and monopoly-priced broadband services from Time Warner, the other potential superfast link to the web in the Greylock region besides MassBroadband is a fiber optic cable buried along the old Boston & Maine railroad right-of-way. It's not clear who controls the cable, installed during the 1990s by the old MCI Telecommunications Corp. or what the cost might be to connect to it. Coming? Small group in Williamstown to meet March 1 to plan "community information hub"
WILLIAMSTOWN, Mass. -- Participants are sought to join an ad-hoc group will meet March 1 to consider information needs of the Greylock region, and the possibility of forming an "online information hub" for Williamstown. The decision to meet came at the end of a community-information needs assessment meeting on Jan. 24. Download MP3 podcast. Monday's meeting will begin at 7:30 p.m. at the First Congregational Church in Williamstown, say co-organizers Bill Densmore and Gail Burns. "We met twice in 2006, and in January," says Densmore. "The technology, ideas and need are all present. It's time take some collaborative baby steps." Participate in a demonstration of Jeff Vander Clute's "Avanoo" social news-networking software. Resume discussing the Knight Commission on Information Needs of Communities report and its list of critical community information needs. Learn about the Shires Media Partnership Inc., a 501(c)3 nonprofit which now owns WBTN-AM 1370kc in Bennington. Consider opportunities for collaboration among regional media and citizens. Take some baby steps at innovation. -- David Scribner, a Pittsfield-based writer and weekly newspaper editor. Scribner, a former editor of The Berkshire Eagle and The Bennington Banner, has applied to the John S. and James L. Knight Foundation for a grant to launch "Newshare Commons" -- a journalist-guided, social news network in libraries, cafes and public spaces. Scribner hopes the Berkshires/SW Vermont will be one test region. -- Jeff Vander Clute, of Palo Alto, Calif., president of CircLabs Inc., a company part-owned by the University of Missouri School of Journalism. CircLabs is working to find solutions for sustaining the values, principles and purposes of journalism in our rapidly evolving media ecosystem. Vander Clute is developing the technology for a "news social network" which might become part of the Newshare Commons project. Vander Clute is a 1995 Williams College graduate and was part of a core group at the start of Tripod Inc. The 12-person group spent 90 minutes considering whether the Williamstown region's "community information needs" are being met, based upona set of 10 key indicators suggested in a reported released in October by the Knight Commission on the Information Needs of Communities. And they added an additional proposed indicator: "Does an infrastructure exist for constructive, civic problem solving?" To get a feel for what a metropolitan area like Seattle can put together to study its 'news ecosystem,' " said Densmore, "Review this page from the Journalism That Matters Pacific Northwest gathering Jan. 7-10 -- http://www.rjiwiki.org . . . . "
Densmore may be reached at 413-458-8001 or densmore@mediagiraffe.org. NORTH ADAMS, MA—National Public Radio Special Correspondent Charlayne Hunter-Gault will speak at this fall’s Hardman Lecture Series event at Massachusetts College of Liberal Arts Thursday, October 15, at 7 p.m. in the Church Street Center. Hunter-Gault, an award-winning journalist with more than 40 years in the industry, delivers a lecture entitled “Africa’s Women on the Move.” The Hardman Lecture Series is made possible through the generosity of the Hardman Family Endowment. The event is free and open to the public. Hunter-Gault is the author of In My Place, a memoir of the civil rights movement fashioned around her experiences as the first black woman to attend the University of Georgia. Her latest book is New News Out of Africa: Uncovering the African Renaissance. A global journalist, Hunter-Gault spent six years as CNN’s Johannesburg bureau chief and correspondent before returning to NPR. She was NPR’s chief correspondent in Africa. Hunter-Gault first joined NPR in 1997 after 20 years with PBS, where she worked as a national correspondent for The NewsHour with Jim Lehrer. She began her journalism career as a reporter for The New Yorker, before working as a local news anchor for WRC-TV in Washington, D.C. and as the Harlem bureau chief for The New York Times. Her honors include two Emmy awards and two Peabody awards—one for her work on Apartheid's People, a NewsHour series about South African life during apartheid and the other for general coverage of Africa in 1998. Hunter-Gault also was the recipient of the 1986 Journalist of the Year Award from the National Association of Black Journalists, the 1990 Sidney Hillman Award, the American Women in Radio and Television award, the Good Housekeeping Broadcast Personality of the Year Award and a 2004 National Association of Black Journalists Award for her CNN series on Zimbabwe. She also received awards from Amnesty International for her Human Rights reporting, especially her PBS Series, Rights and Wrongs, a human rights television magazine. In August, 2005, she was inducted into the National Association of Black Journalists Hall of Fame. Hunter-Gault delivers lectures around the country and holds more than three dozen honorary degrees. She also serves on the board of The Peabody Awards and The Committee to Protect Journalists and is a member of the Council on Foreign Relations. For information on the Hardman Lecture Series at MCLA call (413) 662-5185 or visit www.mcla.edu/speakers. 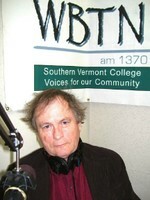 BENNINGTON, Vt. -- Southern Vermont College is convening a day-long seminar on Saturday, May 5, to cons ider how the school might foster establishing a "center for community media," according to David Scribner, a spokesman and journalism teacher for the small private college. Scribner discusses the event with Media Giraffe Project Editor Bill Densmore in a 29-minute broadcast inteview aired on WBTN, 1370 AM, the college's community radio station. For details, go to: http://www.mediagiraffe.org/bennington/invitation.pdf . . . the event is by-invitation-only because of space limitations. To seek an invitation, email Scribner at dscribner@svc.edu . WILLIAMSTOWN, Mass. -- The representative of a new initiative at Boston University is making a presentation on Monday April 2 at Mount Greylock Regional High School on advances in the use of digital-media in filmmaking, photography, animation, game design, graphics and studio recording. The presentation by Bill Chenaille, of BU's Center for Digital Imaging Arts will give a multimedia presentation from 8 a.m. to 9:30 a.m. that is free and open to the public. The presentation was scheduled by Michael J. Powers, M.Ed., the instructional-technology specialist at the regional high school as part of an effort to update the community on career options in digital media. Powres can be reached at 413-458-9592 ext. 142, or home: 802-447-1754 or Michael_J_Powers@comcast.net.